The humpback whale is one of the most well-known whale species to humans. The humpback whale is a well-known whale species and it’s quite popular with whale watchers. It’s one of the largest baleen whale species. These are the largest animals on the planet today. Also, it’s classified as a rorqual whale along with the blue whale, minke whale, Bryde’s whale, fin whale, and sei whale. Rorqual whales are essentially filter feeders. They have between 25 and 100 parallel, pleated ventral grooves (throat grooves) extending from their throats to the flippers. These grooves allow them to take in large gulps of water and then force the water out through their baleen. Thus, they are able to eat the tiny organisms, krill, and small fish left behind from the filtered water. The word ‘rorqual’ means furrow in Norwegian. 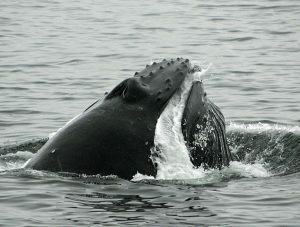 The humpback whale has a unique body shape with its long pectoral fins, and a knobbly head. It continues to fascinate whale watchers because of some of its distinctive behaviors like breaching, and the sounds the male of the species make. Once hunted almost to extinction, the humpback lost about 90% of its population but it is making a steady increase though original numbers have not been restored. Read on and also watch a cool, rarely seen video of humpback whales in their natural habitat. Rorquals can live from 45 to 100 years. This is a large species and adults averagely range from 12 to 16 meters (39 to 52 feet) in length. Adult males average 13 to 14 meters (43 to 46 feet). Females are a bit larger at 15 to 16 meters (49 to 52 feet). The largest recorded female was 19 meters (62 feet) long with pectoral fins measuring 6 meters (20 feet) each. Body mass for the humpback whale averages from 28 to 33 short tons (25 to 30 metric tons). Though, larger individuals can weigh up to 44 short tons (40 metric tons). At leisure, they swim at 3 to 9 m/h (4.8 to 14 km/h). That goes up to 1.2 to 3.5 m/h (1.9 to 5.6 km/h) when they feed and 15 to 16.5 m/h (24 to 26.5 km/h) when they are in danger. Whale watching is a popular sport now and the main character is usually the humpback whale. People like to watch its acrobatic breaching displays and listen to the loud, complex songs the males produce. Participants can watch from shore or on touring boats. In some instances, the whales will be approach the boat out of curiosity. As a result of its popularity, whale-tourism rather than whale-killing is now a growing industry. For instance, Hawaii, earns about $20 million every year just from this industry. Humpback whales are not typically dangerous but they are known to be less friendly around boats when compared to say gray whales, for instance. In particular, considering their large size and tendency to be very acrobatic compared to other whales, it’s advisable to exercise caution around them. Humpback whales migrate from the poles towards the equator during winter months. This signals the beginning of courtship rituals. Getting the attention of the females is a very intense and fierce competition among the males of the species. Males display breaching, lob-tailing, tail-slapping, charging, pectoral fin-slapping, parrying and so on during this time. The popular ‘whale song’ may also be a mating call or to establish male dominance. Females may have multiple partners during their lifetime. Below is a video from BBC Earth showing the intense rivalry among humpback whales during breeding season. 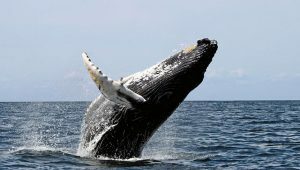 Female humpback whales will breed every two or three years with a gestation period that’s just 2 weeks short of a year. Newborn calves are about the length of their mother’s head and they measure 6 meters (20 feet) and weigh 2 short tons (1.8 metric tons). Also, their mother’s nurse them with milk for 6 months. Females reach sexual maturity at 5 years old and males at 7 years old. Instead of teeth, they have 270 to 400 overlapping baleen plates hanging down from either side of their upper jaw. These plates are about 30 inches (76 cm) long. Baleen is made of a substance called keratin and it’s the same thing human fingernails are made of. Humpbacks feed mostly in the summer months and live off their fat reserves in wintertime. They are energetic hunters going after krill, plankton, and schools of small fish like herring, salmon, mackerel, etc. They hunt small fish by direct attack or they will stun them by slapping the water around them with their huge pectoral fins. Humpback whales have also devised an interesting hunting technique known as bubble net feeding. By attaching cameras to these whales, researchers have been able to get a closer look at how this technique works. school of smaller fish. Some individuals in the group blow bubbles from below driving the fish upwards, while others herd more prey into the circle by making loud noises. Eventually, the whales will swim towards the ‘net’ of fish with their mouths wide open and gulp them in their thousands while filtering out excess water simultaneously. There is evidence that orcas (killer whales) hunt and kill juvenile humpback whales for food. Though the International Union for Conservation of Nature (IUCN) lists the humpback whale as Least Concern on its Red List of Threatened Species, it’s not totally free of threats just yet. In fact, just as recently as 1988, this whale was classified as Endangered. During that time, its population fell by up to 90% in most of its habitats. However, its populations have largely recovered and may be experiencing a steady increase if current trends continue. Commercial whaling of the humpback whale is now prohibited by the International Whaling Commission. Though, in regions like Greenland, they still hunt it for food. Also, in Norway, Iceland and Russia they still kill large numbers of whales annually. In addition, the nation of Japan hunts humpbacks for scientific reasons. IUCN data estimates that there are about 60,000 humpbacks thriving in the wild today. Research indicates that the rorquals diverged from the other families of whales sometime in the middle Miocene period (16 to 11.6 million years ago). Although it’s not known when each individual species evolved from its closest relatives. The humpback remains the sole member of its order though it’s closely related to the giant whales of the genus Balaenoptera, e.g. blue whale. However, more recent DNA analysis show that the humpback is closer to the fin whale than any of the other whales. Their generic name Megaptera comes from the Greek word mega (giant) and ptera (wing). This is because of their large front flippers. Interestingly, the name ‘humpback’ comes from the curving of their backs when they dive. They don’t have an actual hump. They live in seas and oceans all over the world. Their most distinct population distribution is in four areas: the North Pacific, Atlantic Ocean, Southern Ocean and the Indian Ocean. You can find them in each of these regions in parts of the Arabian Sea, in British and Norwegian waters, the Mediterranean and Baltic Sea, Brazil, the Caribbean, Hawaii and so on. There are even more sightings now as their populations continue to recover. Humpbacks feed in polar waters but migrate up to 25,000 km (16,000 miles) each year to tropical or subtropical waters to mate and give birth while they fast and live off of their fat reserves. Like most of the other large whales, the humpback was targeted for decades by the whaling industry for its meat and oil. If not for a 1966 intervention, it would probably be extinct by now. For now, the major threats to this sea mammal includes entanglement in fishing nets, and collisions with boats and ships.